Splash Water Park in Nuevo Vallarta, Mexico. Operational Months: All year long. Admission Includes: Access to all water park facilities as well as their professional dolphin, seal, and sea lion shows. Splash Water Park in Nuevo Vallarta, Mexico. 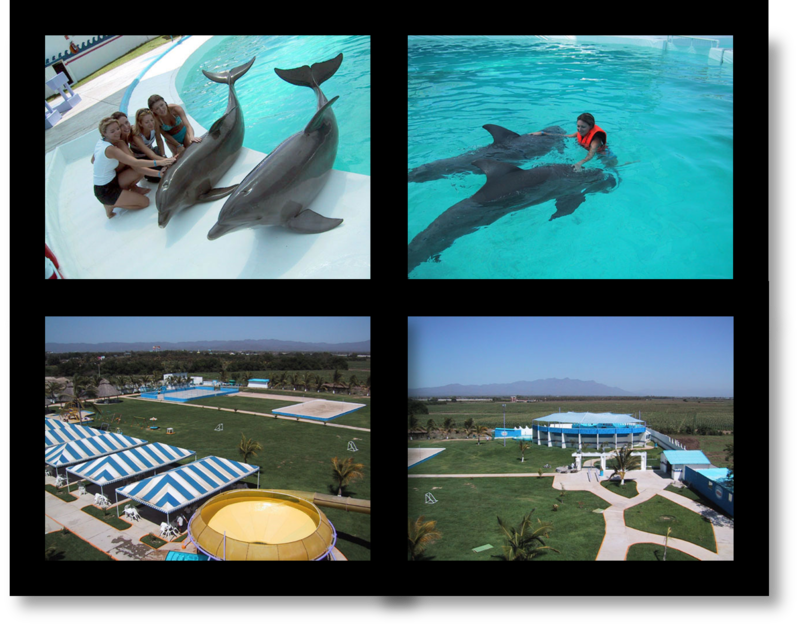 This facility offers dolphin swim programs, as well as dolphin, seal and sea lion shows. The facility has large open areas for outdoor sports. This super fun water slide park is located in Nuevo Vallarta, a quick 10 minutes north of the Puerto Vallarta airport (PVR). The park entrance is right at the southern entrance to Nuevo Vallarta. Splash Water Park is a beautiful new and modern facility. Rides include both water slides and tube rides. There is a special kids’ zone as well as a lazy river. Interactive dolphin swim programs are very popular at this facility, as are the dolphin, seal and sea lion shows. There is also a very large area with gardens a kids’ playground and sandbox, as well as special areas for beach volleyball, soccer, and basketball. Guests are allowed to bring their own food into the water park, but alcoholic beverages and glass containers are prohibited. There are picnic tables available, but no grills. Onsite food options include “La Terraza” restaurant/bar, “La Palapa” bar, pizza, hot dogs, hamburgers, Mexican food, a mini-market, and an ice-cream stand. Water Park – Operational Days/Hours: Monday through Friday, 10 a.m. – 5 p.m.
Dolphinarium – Operational Days/Hours: Every day. Swim programs offered at 10 a.m., 11:15 a.m., 1:45 p.m., 3 p.m. This beautiful water slide park is located in Nuevo Vallarta just 10 minutes from the PVR airport at the first entrance (the south entrance) to Nuevo Vallarta, on the opposite side of the highway from Splash Water Park. Look for Aquaventuras Water Park on the right-hand side when exiting the freeway, just behind the tall, white Eurowindows building. 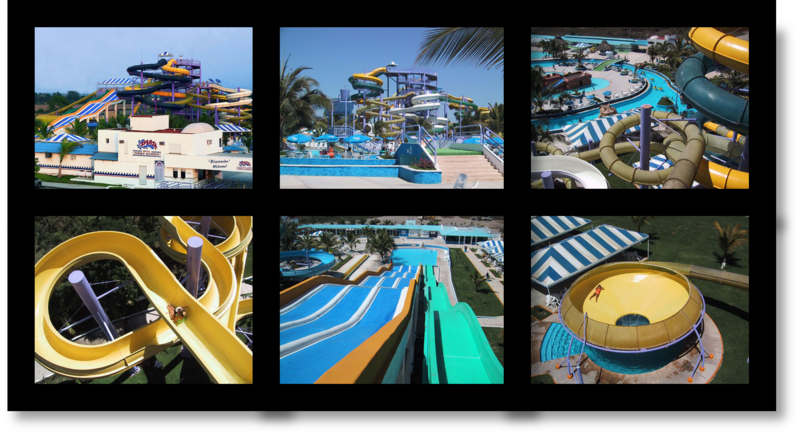 This really fun water park offers 10 exciting water slides as well as daily dolphin and sea lion shows. There is a Water World children’s area with a pirate ship, low-speed mini water tobagans and a kiddie paddling pool. This facility is further enhanced by a lazy river, swimming pool and lounge areas, and a snack bar. At the entrance to Aquaventuras visitors can purchase discounted combo packages that include the water slide park entrance free plus specific food items and beverages. Aquaventuras Water Park and Dolphinarium in Nuevo Vallarta, Mexico. Separate from the water park’s operational hours, Aquaventuras has an interactive aquarium that offers a swim-with-the-dolphins program and sea lion encounters. As of 2014, the participation fee is $25 USD for adults and $19 per child (ages 4-11). Rates for the dolphin (or sea lion) swim adventures program: $109 USD for adults and $79 USD for children (ages 8-11). The dolphin swim fees include water slide park admission. But keep in mind that the water slide portion of the facility is closed on weekends, so be sure to plan accordingly. The prices for professional swim-with-the-dolphins photos start at $16 USD, with the prices for videos starting at $39 USD. NOTE: All hours and prices listed above are subject to change.